Observation - White-Tailed Eagle - UK and Ireland. Description: Stunning sea Eagle, like the Bald Eagle in North America and the White-tailed Eagle in the UK, but this one seen in Hokkaido, Japan - where many winter near Stellers Sea Eagle. 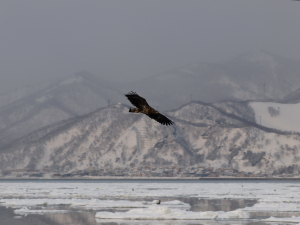 Stunning sea Eagle, like the Bald Eagle in North America and the White-tailed Eagle in the UK, but this one seen in Hokkaido, Japan - where many winter near Stellers Sea Eagle.